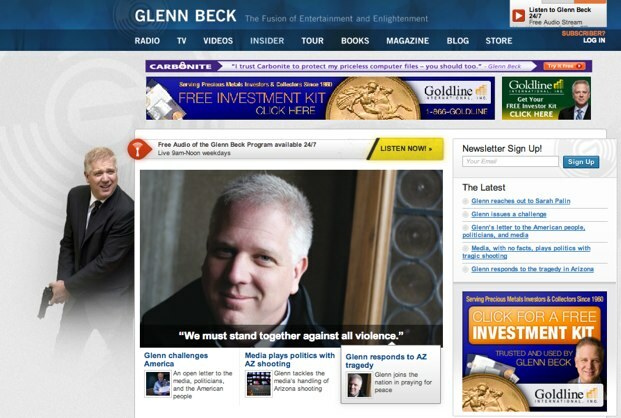 Apparently, right wing pundit Glenn Beck likes to stand against violence with a gun in his hands. At least that’s the impression you might get if you visit his website. 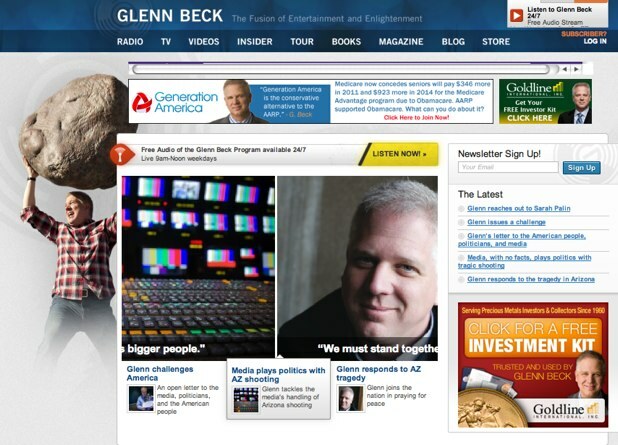 One of the top three featured articles right now is his response to the Arizona shooting of Congresswoman Gabrielle Giffords with the reasonable quote: “We must stand together against all violence.” But if you look to the side, you might also catch a photo of Beck peeking around the corner a gun in his hands (see screenshot above). It’s as though he wants to shoot the crap out of violence. Or maybe he wants to stand together and sing Kumbaya. Will the real Glenn Beck please stand up? Let’s Shoot The Crap Out Of Violence. Update: It appears that the gun image has been removed from the site.